221 Ashley Avenue was a bank owned property when CKC Properties acquired the land in 2012. There had previously been a wedding chapel at this location and after doing a brief review of zoning regulations CKC determined that the purchase would allow for 3 housing units on the site and began creating the vision. Chapel lofts is a multi-family Urban infill project located on Ashley Avenue between Cannon and Spring Street within the Cannonborough/Elliottborough neighborhood. This project incorporates the adaptive re-use of a former wedding chapel into a 4-Bedroom, 4.5-Bathroom loft apartment unit. To the rear of this structure CKC constructed an additional 2-unit apartment structure on the parcel. The 2-Unit apartment structure in the rear includes two 1,400 square foot; 4-Bedroom; 4-Bathroom apartment units. A few years after its completion in 2012, the Chapel was converted to a short-term rental in 2017. 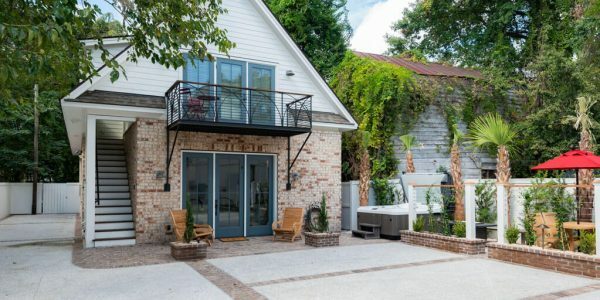 This conversion required a minor renovation to the interior and major renovation to the exterior that include all new hardscaping and landscaping as well as the addition of an 8 person hot tub, fire pit and grilling patio. This was CKC’s first venture into the hospitality business and due to its success CKC has made this conversion to both other units on the property and 8 more additional units throughout the CKC portfolio. 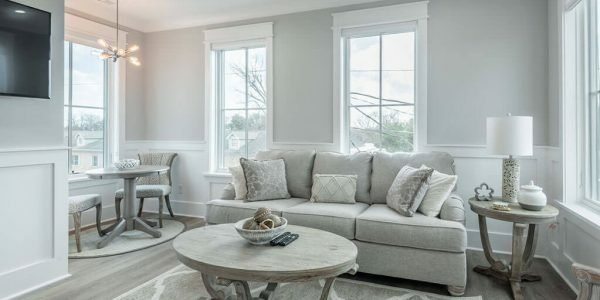 The venture into the short-term rental business has been a great success and would not have occurred with the acquisition of this property many years prior. During the Chapel renovation, CKC added three dormers to the south and north elevations to increase natural light and ceiling height on the second floor. A second floor of living space was added and extended about half way down the structure. This “loft style” floor plate overlooks the large, open, vaulted ceiling, kitchen living area below. The new rear structure on the property includes upper and ground level 4-bedroom apartment units. This building is constructed of all brick veneer at the first level with Hardie Plank fiber cement siding above. The upper apartment enjoys an iron balcony, while the lower apartment includes an outdoor patio and green space. One of the most architecturally pleasing aspects of this development is the floating staircase in the Chapel. This was built with restoration heart pine stringers, 3.5″ thick heart pine treads and rail caps. The handrails are made of galvanized metal creating a unique contrast of historical and contemporary elements. This truly turned out to be a centerpiece of the Chapel.